Fudge Topped Brownies were created in an effort to use up half a box of brownie mix and a partially filled can of condensed milk. And hooray! The result of my attempt to “get rid of stuff” is a really good tasting brownie which I will definitely make again. Next time I’ll go with a scratch base, but even the brownie mix base is good. Basically, this is the old fool-proof fudge recipe poured on top of a batch of brownies, but in this case I finally nailed the right proportions of chocolate to condensed milk to butter. In the past I’ve made the fudge topping to sweet or too chewy. This one was just right — somewhere between a piece of fudge and icing. I made a half batch using an 8 inch square pan. This version is a full batch and calls for a 9×13 inch pan. Brownies topped with a mixture of condensed milk and chocolate chips. Prepare the brownie batter as directed on the package, but add 8 to 10 broken chocolate sandwich cookies to the batter. Spread in a nonstick foil lined 9x13 inch pan. Bake for about 28 minutes or whatever the box of your preferred brand of brownie mix says. As soon as the brownies are done, combine room temperature butter, 1 cup of condensed milk, and chocolate chips in a saucepan. Turn heat to medium or medium low (low and slow is the way to go – don’t overheat the mixture) and stir until chocolate is melted and smooth. Stir in the vanilla. Pour over the brownies. If desired, sprinkle toasted pecans over the top. Let cool and set. Instead of boxed brownie mix, use your favorite scratch recipe. Ooh, this sounds good. (I know, I’m so behind.) Have to make a treat for something Friday night, these might do the trick. I like that they are brownies, but have something different. The brownies look decadently wonderful! oh my gosh those look incredible! i love the fact that there are oreos in them! Carol, the Oreos are completely optional! I like the extra texture, but these would be great without them. Cindy, humidity is a concern when you are making fudge from scratch (with sugar, cocoa powder, etc.). With this condensed milk, butter & chocolate version, you don’t have to worry. You are killing me with all of these good recipes! LOL! 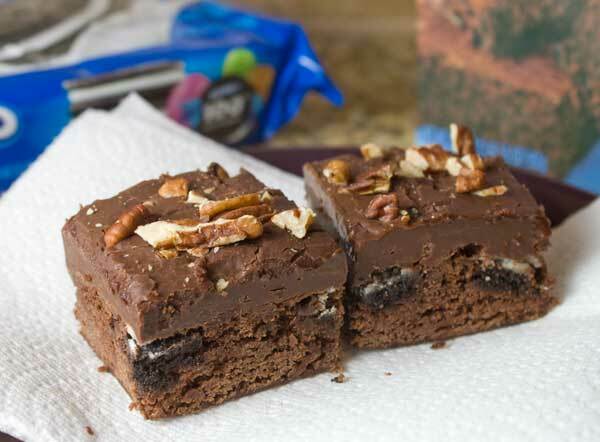 I have got to try this with my favorite homemade brownies, sans the oreos. I like oreos, but I don’t want to add them to the texture which the smooth creaminess off the fudge and the chewiness of the brownie. Will try these when it’s cool enough to bake. One question – do you think humidity (or lack of) affects the fudge?